Well, blow me down. For ten years they’ve been putting on concerts at the Morris-Jumel Mansion, in upper Manhattan, and no one told me until now (thanks GEMS). 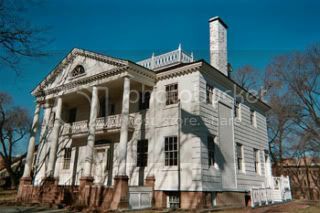 Apparently the oldest still-standing residence in the city, the mansion was Washington’s headquarters in 1776 and is a museum now, with period furnishings from the 18th and 19th century including some things that belonged to the Jumels themselves. My grandmother wrote a historical novel about Madame Jumel (long since out of print) but I had never visited the mansion until this past Saturday, when Elisa and I took that long ride on the #1 train to check out the museum and see a concert, held in the room where they used to have concerts two centuries ago. The concert featured the Brooklyn Baroque, a marvelous trio, who performed a program called “Bach and His Contemporaries.” Baroque flutist Andrew Bolotowsky (whom I’ve seen before, I think with Muse) and baroque cellist David Bakamjian were masterful. A special treat was hearing the harpsichord so clearly. Rebecca Pechefsky plays with feeling and a sure touch, but so often in early music concerts in larger halls the harpsichord is barely audible. Not here. Another cool thing about early music concerts: we get to be among the youngest people there. That doesn’t happen too much anymore! This entry was posted on Monday, November 9th, 2009 at 6:01 pm	and is filed under Music, New York City. You can follow any responses to this entry through the RSS 2.0 feed. You can skip to the end and leave a response. Pinging is currently not allowed.